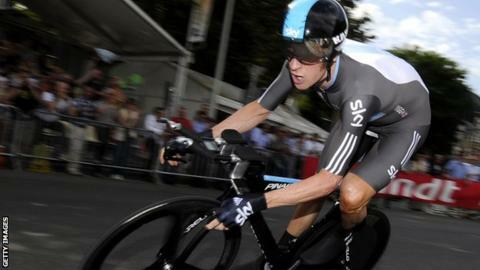 Fabian Cancellara's stunning time trial denied Bradley Wiggins the first yellow jersey of the 2012 Tour de France. The Swiss rider raced home in seven minutes 13 seconds to beat Britain's Wiggins by seven seconds in the opening 6.4km prologue in Liege, Belgium. France's Sylvain Chavanel was third but pre-race favourite Wiggins leads 2011 winner Cadel Evans by 10 seconds. "It's the perfect start," said Wiggins. "I said to the team there was one man who could beat me and that was Fabian." He added: "I was really calm, really relaxed. I keep taking myself back to reality by putting my headphones on, taking myself out of this madness because this isn't reality at this moment. "It's just a bike race. It would be very easy to be drawn into all this. There's a long way to Paris." Cancellara produced a tremendous display of time-trial riding to win his fourth successive prologue and in doing so equal Bernard Hinault's record of starting the first stage in yellow for a fifth time. He broke his collarbone in a fall during the Tour of Flanders in April and had been a doubt to make the start of the Tour but showed he was feeling no ill effects on the streets of Liege. "Every victory is important but [Saturday] was special after a hard comeback," Cancellara said. "I've done what I had to do. I was motivated and it's a victory I won't forget for a long time." Chavanel surprised many by setting a target of 7'20" midway through the prologue and his time proved unbeatable until Wiggins crossed the line. The 32-year-old was six seconds down at the intermediate split but powered through the second half of the race to eclipse Chavenel's time by less than half a second. This year's Giro d'Italia winner Ryder Hesjedal and another rival for the overall victory, Italy's Vincenzo Nibali failed to threaten Wiggins's time, while Evans, as defending champion the last man to complete the course, also lost ground. However, the Australian was not overly concerned with his start. "It was not good, but not bad," said Evans, who has also twice finished as runner-up. "That went pretty much as we thought it would. Cancellara was very much the favourite and proved he is in good condition, while Wiggins will be satisfied. Deep down he will not have expected to beat Cancellara but he has put 10 seconds on Evans. It's not a significant gap and Evans will not be worried. Likewise, Wiggins will not be thinking that the job has been done." "It's 6.4km out of 3,500, so in that regard it's a small comparison." World time trial champion Tony Martin's hopes of a win were ended by a puncture, although the German recovered to finish just 23 seconds adrift, while sprinter Peter Sagan, a Slovakian chasing the green points jersey which Cavendish won last year, lost crucial seconds when he almost crashed on a bend. Brits Chris Froome, Stephen Cummings, David Millar and Mark Cavendish all produced strong time trial performances to finish 11th, 14th, 15th and 42nd respectively. Sunday's stage one is a 198km ride from Liege to Seraing which features a 2.5km ascent to the finish. 2. Bradley Wiggins (GB) Team Sky @ 7"
4. Teejay van Garderen (US) BMC Racing @ 10"
5. Edvald Boasson Hagen (Nor) Team Sky @ 11"
9. Philippe Gilbert (Bel) BMC Racing @ 13"
11. Chris Froome (GB) Team Sky @ 16"
13. Cadel Evans (Aus) BMC Racing @ 17"
14. Vincenzo Nibali (Ita) Liquigas @ 18"
42. Mark Cavendish (GB) Team Sky @ 23"
138. Frank Schleck (Lux) Radioshack Nissan Trek @ 38"